There is something that being wealthy or powerful do not always protect anyone from and that is nemesis or the moment of truth. If you call it synthesis, you would still be right. That is when all lies, all hypocrisy and all smartness give way to the majesty of truth. It is not truth in a moral or religious sense but truth as when the contradictions of a subsisting reality attain that height of absurdity, producing something new despite and in spite of itself. There is a sense in which that is what we might soon be witnessing in Nigeria. It can be called a revolution. You may say that a David Cameron or a chairperson of the eight most industrialised countries in the world, aka G-8 can only be an unlikely revolutionary. But what do you call anyone who champions locating, recovering and returning all looted wealth to Nigerians? That is the revolution of the moment and it is permitted to call whoever is in it a revolutionary in the context. David Cameron’s speech on January 24, 2013 at the Economic Summit in Davos did not make the front page story in Nigeria newspapers. But his use of Nigeria as a case study of where transparency and accountability are totally strange to power did not escape the attention of those he was addressing if two recent Nigerian events in London are anything to go by. Two or three paragraphs out of his 3,110 words speech at Davos are very direct and interesting in this regard and we must quote him in full: There is a long and tragic history of some African countries being stripped of their minerals behind a veil of secrecy. We can see the results: the government cronies get rich, some beyond their wildest dreams of avarice, while the people in those countries stay poor. … I want this G8 to lead a big push for transparency across the developing world, and to illustrate why let me give you one example. A few years back a transparency initiative exposed a huge hole in Nigeria’s finances, an eight hundred million dollar discrepancy between what companies were paying and what the government was receiving for oil - a massive, massive gap. The discovery of this is leading to new regulation of Nigeria’s oil sector so the richness of the earth can actually help to enrich the people of that country. Once the G-8, as also a key international security actor, convinces itself that state collapse in Nigeria will be an unmanageable complex emergency, they will get the agencies and companies crucial to this to do what it takes to stabilize Nigeria. In that sense, locating, recovering and returning looted wealth to Nigeria becomes a simple exercise in pragmatism and in which they can sacrifice anyone to the larger goal of staving off a poverty - induced anarchy in Nigeria. It must be a revolution coming indeed because Cameron could not have been grandstanding or saying what is not already a consensus in the G-8. And since neither the G-8 nor its chair can be bribed, intimidated or diverted from blocking a strategic threat to international security such as state failure in Nigeria, it is safe to assume that Nigeria will, somehow, soon be in for a moment of fresh air . However, it important is to watch out for the contradictions of the Cameron revolution as it unfolds because every reality is its own anti-thesis. The heritage of living off Nigeria via the harvest of scams: the privatisation exercise especially as it affected NITEL and other SOEs; the power sector probe; the 2006 debt repayment; NNPC; the oil subsidy scam; the pension scam and what have you means that loot recovery is stepping on hyper-sensitive but weak toes, weak because they are not on high moral grounds. 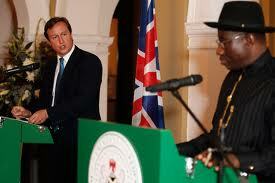 It is against that background that an equally advisable thing for Prime Minister Cameron and the G-8 to do about Nigeria in addition to the loot recovery agenda is pushing for a consensus presidential candidate in 2015, using their leverage. Consensus was how stability was restored in 1999 because Obasanjo was, at that time, acceptable across the country and the world. Western Nigeria did not accept him but that even became his greatest qualification internally. And his coming did stabilize the post June 12 conflict situation. What happened thereafter is a completely different story. The situation today is not fundamentally different. Nigeria is, in fact, in worse shape, totally at a cross road, its survival challenged by the escalation of violence across the country as well as the level of corruption and the problematic regional and incumbency claims to power. In this sort of situation, only a consensus is the way out so that everybody is a winner at the end of the day and no one is tempted to adopt desperate options in gambling for power. In the spirit of looking inward for solutions, some of us assumed and even advocated that some of our senior citizens would, in spite of being the architects of the ruining of Nigeria, push for this sort of consensus as a way of restoring Nigeria. Such a consensual approach would have taken care of the accumulated frustrations and pains felt by almost every segment of Nigeria, pains which have totaled into the virtual impossibility of beneficial politics. The senior citizens might have been doing their bits secretively but certainly not in a strong enough manner to respond to the clear and present danger facing the country. Since nature abhors a vacuum, a Cameron has stepped in. And we can not talk about neo-colonialism without sounding jaded in this circumstance. Nobody says picking a consensus presidential candidate in Nigeria would be a simple operation. But not if we anchor it on two imperatives critical to restoring stability immediately. The first is restoring the regional power pact (rotation of power) so that succession does not become the threat it now is to the democratic order. The second is then narrowing the search to that one individual whose political personality can compensate for a system which has lost its soul and its institutions. Political personality here is defined to refer to three elements: (1) a developed mind capable of rationality, objectivity and a sense of innovativeness, (2) a sufficient technical preparation for power so that apart from mastery of statecraft, the Nigerian president is one who appreciates what it means to be a first among equals as far as Nigeria and speaking for Africa is concerned and (3), a cosmopolitanism that is a critique of any form of identity baggage or localism. The assumption is that a combination of these three elements should produce someone with the modernist mindedness to supervise a capitalist revolution in Nigeria that should, for example, lead to Nigeria’s membership of the BRICS club in a matter of a few years. Finding this consensus candidate can be a mission impossible because in a recent sufficiently objective survey, one found that only two or three people eyeing presidential power have anything called a development strategy, whether radical or conservative. But a capitalist revolution is the way forward now because the problems of Nigeria arise mostly from the unique primitivity of its capitalism and the violence it breeds as reactions to the alienation and exclusion of the majority from the benefits of modernity. A capitalist revolution is also the only way for Nigeria to move away from politics as sharing to politics as production. This requires a consensus choice with the intellectual or political education to appreciate how strategic a capitalist revolution is to Nigeria’s survival today. Or so that s/he does not end up relying completely on briefings by others who are themselves too politically deaf and dumb to appreciate or replicate the patriotism of the David Camerons and Barrack Obamas of this world when it comes to managing an unusual depression. For example, in the Davos speech, Cameron insisted on trade, tax and transparency to the point that he sounded anti-capitalist. But he was not being anti-capitalism but about securing capitalism. And so that s/he would be someone who appreciates that the country, at the moment, has nothing to show as far as universities are concerned. The academics and their students are trying but the environment is totally against the very idea of a university. However, as long as universities are the only source of the doctors we need to deliver 21st Century health care, the men and women who will protect Nigerians from new security challenges in the 21st Century as spies, policemen, soldiers and sundry security experts, the specialists in science, technology, architecture, engineering and agriculture who can network us into and sustain us in modernity, it means we need someone who will personally prioritise universities as a national security issue as opposed to the lousy thing we are doing in that sector now. Again, at Davos, Cameron insisted on world-class universities as a corner stone of the emerging order. Nigeria started in 1960 with world class universities which made elites out of children of peasants for whom education was the most dignified model of social mobility. What is the situation today? Totally disastrous and no patriotism should make anyone say anything different about what we parade as universities today in Nigeria. In other words, a consensus candidate is desirable so that we stop kicking ourselves over nothing. Meanwhile, may we thank Prime Minister David Cameron in advance for what he plans to do? And for using Nigeria as a case study of the depth of corruption and lack of accountability at his Davos speech. Even that alone is something. As the Idoma people say, when someone is helping you carry a heavy load, s/he has reduced your task to telling him sweet stories so that he can go far. We have enough stories to last Cameron and his colleagues in the G-8 while they are in this business of locating, recovering and returning looted wealth to the country.